contact us for equipment pricing and or application questions. we can be reached at (269) 382-2050 today. KS690HV 6 x 90 inch heavy duty industrial horizontal belt grinder is a versatile belt grinder is a heavy duty, direct drive unit that comes standard with an 8″ x 6″ 70 duro serrated contact wheel that has full left to right movement that allows for easy corner shaping, beveling, grinding, deburring, flat work, descaling, angel work and roughing. The high surface speed of 7200 SFPM delivers quick metal removal with minimal heat. 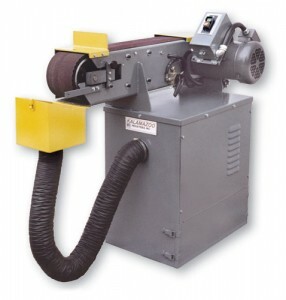 KS690HV 6 x 90 inch heavy duty industrial horizontal belt grinder is also available as a non-vacuum unit and available. As with all Kalamazoo Industries machines, theKS690HV 6 x 90 inch heavy duty industrial horizontal belt grinder is made in the USA. Remove metal FAST with no heat! Spark chute flips up for horizontal / vertical work. Kalamazoo Industries KS690HV-5 parts list. Kalamazoo Industries KS690HV-5 cut sheet.